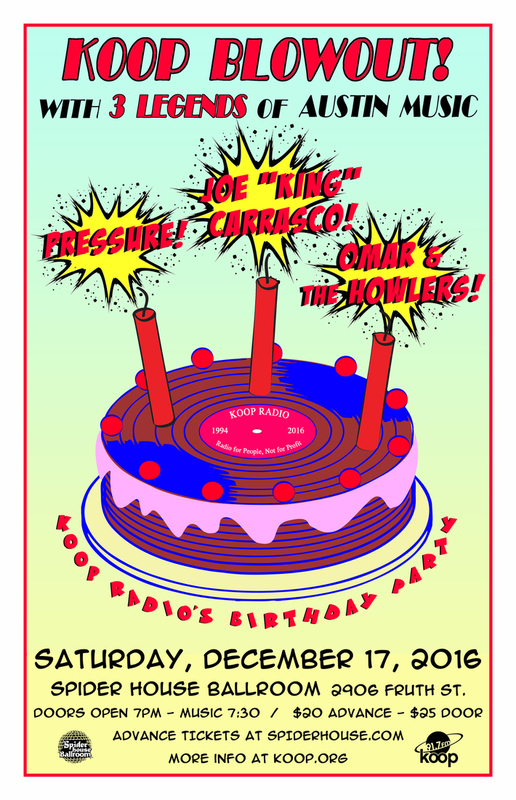 Austin’s independent radio institution is throwing a BIRTHDAY BLOWOUT with THREE LEGENDS of Austin music! First up, the legendary rocking blues of Omar & The Howlers! Next up, the historic reggae band from the Liberty Lunch days, Pressure—recently reunited for select shows, including this one! Then, closing the night, the one and only King of Tex-Mex and Nuevo Wavo, Joe King Carrasco with his great band, Los Side FX! We’ll have door prizes and your favorite KOOP DJs. All proceeds benefit KOOP Radio, keeping independent radio alive and well in Austin! Advance tickets are $20; admission is $25 at the door. Doors at 7:00 PM; music starts at 7:30.